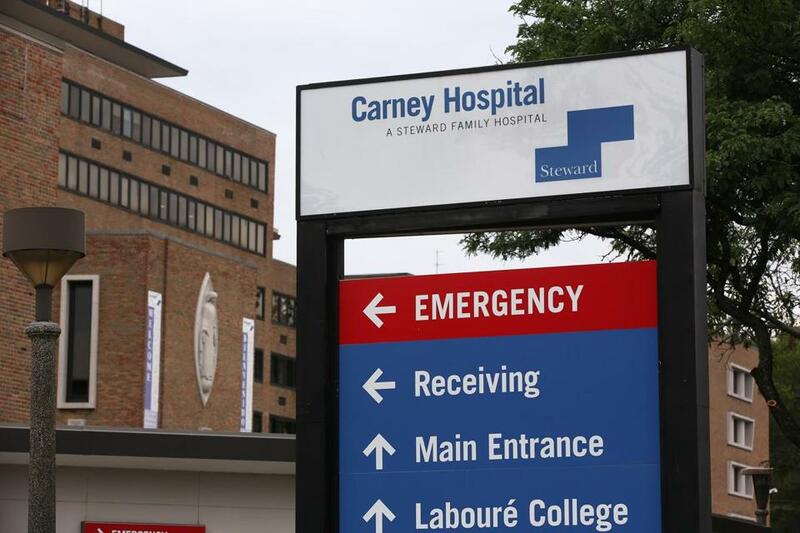 Steward Health Care System has agreed to sell the properties that house its hospital, including Carney Hospital in Dorchester, to a real estate investment firm. Steward, the largest for-profit hospital operator in Massachusetts, was created in 2010 when Cerberus Capital Management bought the former Caritas Christi network of Catholic hospitals. It said it will return the New York-based firm’s original investment, though Cerberus will continue to hold a majority stake. Steward owns nine hospitals in Eastern Massachusetts, including St. Elizabeth’s Medical Center in Brighton and Carney Hospital in Dorchester. It struggled initially to attract enough business to turn around the struggling hospitals it acquired, but last year the company posted an operating profit for the first time since the Cerberus deal. Steward’s chief executive, Dr. Ralph de la Torre, said the MPT investment will give Steward a second source of capital funding and allow it to grow its model of community-based care in other states. “This validates the model,” he said in an interview. The deal, which is expected to close during the next quarter, is also designed to allow top Steward leaders to have a “substantially larger stake” in the company. Under the 2010 buyout agreement, Cerberus invested $430 million to $450 million to pay off Caritas debt, finance renovation projects, and provide working capital, while also assuming its pension liability. When Steward was formed, company officials said they wanted to expand beyond Massachusetts, but those plans didn’t materialize. Instead, several of the hospitals continued to struggle financially and one of them, Quincy Medical Center, was shuttered in 2014. De la Torre, a heart surgeon who has led the company since its founding, said this is the right time to expand. He said previous expansion plans were delayed by the implementation of the Affordable Care Act, or Obamacare. Steward officials didn’t say where they were scouting for acquisition targets, except that they would seek other health care providers that invest in wellness, prevention, and managing patients’ care. The agreement allows MPT to participate in up to $1 billion of Steward’s future hospital acquisitions. The real estate firm’s investment gives Steward greater flexibility to do deals, said Robert Huckman, a professor at Harvard Business School. “At this point, the ability to grow is an attractive option for any large provider system. It provides the potential to serve broader populations,” he added. Although Steward posted a profit in 2015, without a change in employee pensions it would have lost about $1 million on operations. That followed four years of losses. Steward’s revenue grew about 1 percent to almost $2.2 billion last year. MPT, a public company, said Monday that it was selling 33.5 million shares of its stock to help fund the deal with Steward. MPT’s stock fell 2.9 percent in after-hours trading to $14.55. “We look forward to expanding our relationship with Steward in the years ahead,” MPT chief executive Edward K. Aldag Jr. said in a statement. Steward said the deal does not need any approvals from state officials, but they will notify federal officials, as required by law. Attorney General Maura Healey’s office, which has tracked Steward’s progress in Massachusetts, declined to comment on the financing deal.